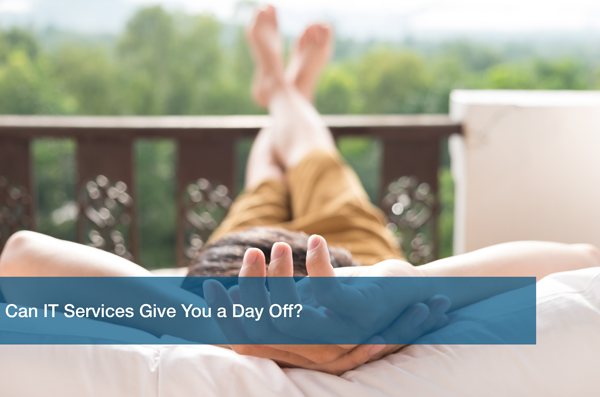 Can IT Services Give You a Day Off? The start of November means that the holidays will be here before you know it! As a small business owner, are you prepared? Are you taking time off to enjoy the holidays with family and friends? Will your business be covered in your absence? Staff, IT services, and small business technology can help give you time off. When you started your small business, you probably did everything yourself. You were the owner, manager, and janitor of the place. Not anymore. Hopefully you have surrounded yourself with a staff that supports and cares for the business as you do. This is typically discovered in the interview process. Other things to pick up on during an interview is whether the applicant would be a compliment to your small business culture. Can you see this person working with your clients? Besides interview jitters, is this person open to accepting your questions? Is this person providing answers that will make your life easier down the road? Taking these questions into consideration during the interview process will ensure that you have a strong employee that is ready to support you and your small business. This means you are also one step closer to your day off. What role do IT services play in your time off? Great question! You are going to want an IT partner that will be exactly that, a partner. Your IT services provider should be an active member of your team. IT services should include monitoring and quick response time in the event that systems go down or employees need help with small business technology. IT services and support should be the last thing on your mind on your day off. Your IT services provider should hold down the technology fort so you can get a break. Make sure your IT services provider works as a partner and that you are not being underserved by your current provider. Businesses are heading to the cloud, is yours? You are getting closer to being able to take a day off, but that little voice in your head is still screaming that you should be able to check in. You can give in a little to that voice and check in on things from anywhere with cloud-based solutions. Cloud services offer greater scalability, security, efficiency and flexibility than their on-premise counterparts. The remote access allows you to check in on your business in the office, on the road, or at home. Also, worth mentioning again, your IT services should be able to help you get this setup. Make sure you are not being underserved! As a business owner, taking time off may feel like a fantasy, but research shows an increase in job performance after time off. Doesn’t that sound amazing? You get to reconnect with the world AND be more productive? Get started with IT services today so you can cross one worry off your list and enjoy your day off!